It sure seems like you can't go wrong with a book from the Pamela Dorman imprint. Maybe one of the reasons I'm so fond of her books is because she publishes Jojo Moyes! 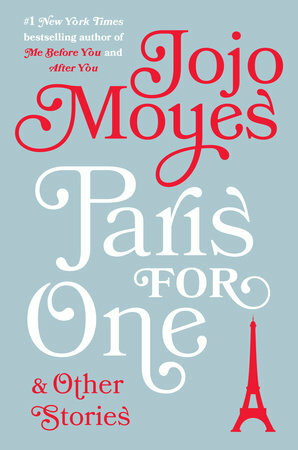 Ms. Moyes' latest book, PARIS FOR ONE & OTHER STORIES, is a little bit of a departure for her -- but not really! While it's a collection of stories instead of a full length novel, the main themes are still about women and love. PARIS FOR ONE begins with a novella called... "Paris for One," and then is followed by eight short stories. "Paris for One" tells the story of Nell, a young woman who has never been to Paris but has always dreamed of having a romantic weekend there. She books a trip with her boyfriend (who we learn pretty early on is a bit of a jerk! ), and he decides not to show up last minute -- last minute like Nell is already there! Instead of rushing home, Nell decides to prove to everyone that she can have a wonderful time without worrying about every little thing. She makes the best of Paris... and even meets a guy! The following eight short stories have similar themes to "Paris for One." They are focus on women who aren't exactly content in their lives and searching for something more. There is a story about a woman who meets a former lover at a dinner party and learns that things weren't quite how she remembered. Another story tells about a husband and wife who go away for a much-needed long weekend, and the wife ends up discovering what's important to her. And there is one story (my favorite actually) that shows what happens when one woman wears another woman's shoes for the day! I have to admit that I enjoyed the novella more than most of the stories. That could just be my bias because I'm not a huge fan of short stories, but I definitely liked it the most. I think the character of Nell just captured my heart... and it's possible that I could relate a bit to her. "Paris for One" was such a sweet story about a woman who discovered the potential of living and love. And it had all the trademarks of a Jojo Moyes love story -- romance, humor, and charm. Overall, I think PARIS FOR ONE & OTHER STORIES is a fun read... and perfect for this time of year when you just need a little escape from the hectic nature of the season. I highly recommend this book for fans of Jojo Moyes and readers who enjoy sweet stories about love and women. You're not the first person to say the novella was the best part of the book. It all sounds good to me!